Please check out the daily details of our Love Spain 2018 Vision Trip itinerary from September 21-29, 2018 below. We begin in Madrid with a day of community service with the Rivas Light and Life Cultural Center followed by a bus transfer to scenic and historical Andalucia, the southernmost region of Spain. Our vision trip makes stops in Cordoba, Seville, Jerez de la Frontera, Cadiz, Ceuta (in North Africa! ), Malaga, and Granada. We will be learning from and volunteering with various churches and strategic ministries serving migrants and refugees in the region. We will also have ample time to sightsee and shop and will stay in four star and above hotels - the last two nights in Granada, site of the magical Alhambra palace. Each registrant's fee helps us pay for a half scholarship for a Rivas Light and Life Cultural Center student and participants are encouraged to raise the half scholarship match ($360). Participants may also sign up for the prior Love Spain 2018 Cycling Tour from September 14-23 and join up on September 23 in Seville with participants on this Love Spain 2018 Vision Trip at a reduced combined cost. For additional details about both trips, consult the blog for occasional updates. All participants need to fly into Madrid, Spain - arriving early afternoon at the latest, if possible. We will do all airport pickups and transport you to a nearby hotel where you will be staying for two nights. We will organize a lunch at a church in Rivas Vaciamadrid where we will make introductions, discuss overall organization and schedule of the event followed by a "Love Spain" campaign presentation. 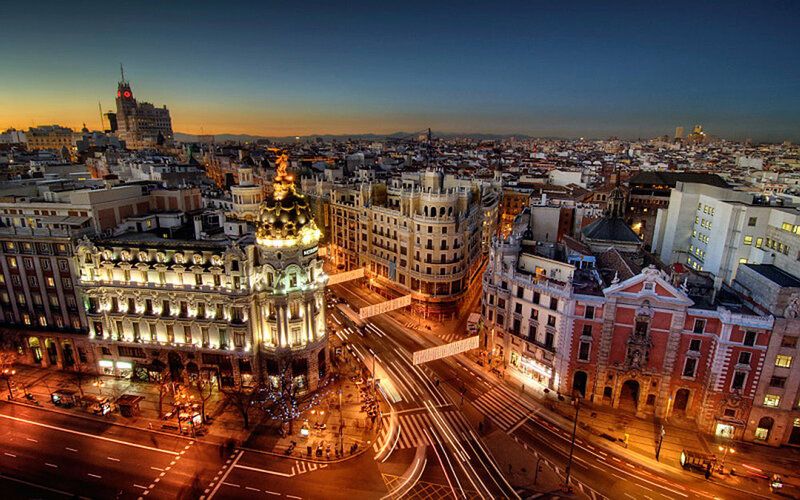 We will then take a two-hour tour of Madrid highlights before letting you crash for an early night back at your hotel. We will be staying in Rivas Vaciamadrid for the day to get involved in activities in conjunction with the Rivas Light and Light Cultural Center. You will have a chance to meet some of the students and we will plan a variety of community events and volunteer for some of the Cultural Center's activities. We might also go on a walking tour of "La Cañada Real" an informal settlement adjacent to Rivas Vaciamadrid where some of our students live. We will plan an evening pool party and "paella" dinner at the home of Peter Clark, a long-time Rivas Vaciamadrid resident. We will depart Madrid early by bus for the four-hour drive to Cordoba, where we will stop for a church service at a local church actively working with immigrants and refugees, tour the ancient city center, visit the old mosque (now converted to a church) dating from Moorish occupation times, and continue on for another 80-minute drive to Seville where we will be staying within walking distance of all the major sites in the historic city center. At our hotel we will meet up with any cyclists staying on past the end of the Love Spain 2018 Cycling Tour who wish to extend their time in Spain to join our group. Evening is free to explore Seville. In the morning, we will drive from Seville one hour south to the town of Jerez de la Frontera, where we will visit a Spanish church working closely with local migrants and refugees, a very encouraging example of how local churches in Europe can engage the crisis. We expect hands on interaction with a variety of ministries - the church teaches in five different languages, provides job counseling, cooking classes, even flamenco lessons! 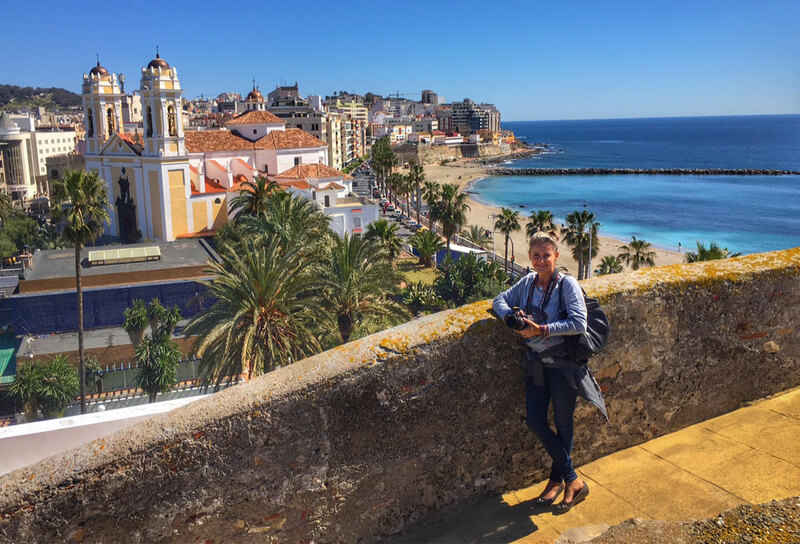 After our stop in Jerez de la Frontera we will continue on to Cadiz, a further 30 minutes to the south on the Mediterranean coast, where we will stay near the historic city center. Every year, during Carnival, the citizens of Cadiz remember their history as a port from which many explorers departed for the New World. The warm air and the Mediterranean breeze should get everyone in the mood for more adventures in southern Spain the following days. In the morning, we will first make the ninety-minute drive to Algeciras, the port where ferries depart from Spain to Morocco and other parts of North Africa - and some migrants enter Spain - where we will take the hour ferry across the Mediterranean to Ceuta, a Spanish enclave in North Africa. Some call it the front line - the point of entry for many migrants and refugees seeking to enter the European Union. We will visit some extraordinary, strategic work in Ceuta, where we will meet detained migrants and spend the night at a lovely local hotel. In the morning we will take the ferry back across from Ceuta to Algeciras and continue driving east near the southern coast to Malaga where we will visit outstanding ministries working directly with migrants as well as developing strategic communication with and for them. The directors of the programs have amazing stories to tell. Thursday morning in Malaga we will continue to visit and volunteer at strategic ministries in Malaga, before continuing on a 90-minute drive to Granada where we will be staying for two nights in the vicinity of the beautiful Alhambra palace. In the evening we might take in a typical, local dinner at a live flamenco show inside a local gypsy cave. During the morning in Granada, we will take a tour of the Alhambra followed by extended time to wander Arab and Jewish quarters in Granada followed by a meeting at a meeting with a team running local outreaches. There are many interesting stories of transformed lives. We will tour a tea house that is a strategic ministry point and have an evening private dinner within the old city quarters. A great way to close a great week! Alas, this trip too comes to an end and everyone must set sail for the farthest parts of the earth. Our hope is that the trip educates you, raises awareness, and touches your heart for migrants and refugees. We hope the people you meet inspire you and you see the strategic value of what they are doing. We hope you will be able to transmit many things back to your families, friends, and churches based on what you have seen, heard, and participated in. We hope you gain a broader and strengthened vision. We are grateful for what you will contribute to "Love Spain." Morning flights out of Granada connect easily in Madrid to overseas international flights that will get you back home the same day - even if you live far from Spain! In order to become an official participant in the Love Spain 2018 Vision Trip, everyone must register and pay below. Scroll down on the registration filling in all items as you go. Once you have completed the registration, proceed to make your payment. The total cost of the Love Spain 2018 Vision Trip is 1695 euros payable only via this website. A 4% PayPal processing fee will be added to your payment. Payment covers all internal travel, lodging, trip shirt, and breakfasts during the entirety of the trip starting from lodging on the night of September 21, 2018 and ending with breakfast on September 29, 2018. Lodging will normally be 4-star and above in Paradores and other hotels (double occupancy). Payment does not cover international travel, lunches, dinners, tips, snacks, drinks, entrance fees, and incidentals with the exception of four catered meals (luches and dinners) during the event, entrance to the Alhambra, and a guided tour in Granada. 1,595 euros is the early bird price for those registering and making a deposit payment of 595 euros or full payment of 1,595 euros by June 15, 2018. After this, the price rises to 1,695 euros so get your early bird payment in as soon as possible. If you make the early bird deposit payment of 595 euros by June 15, 2018, you can then make the remaining 1,000 euro payment by August 15, 2018. All payments are fully refundable (less processing fee) prior to August 15, 2018 and transferrable but entirely nonrefundable after August 15, 2018. THE FINAL DEADLINE FOR FULL PAYMENT FOR ALL PARTICIPANTS IS August 15, 2018. SPECIAL OFFER: You can save 400 euros on the price of the Love Spain 2018 Cycling Tour, which immediately precedes the Love Spain 2018 Vision Trip, if you register for it in conjunction with this Love Spain 2018 Vision Trip, making the additional price of the Love Spain 2018 Cycling Tour 1,095 euros for early bird registrants of the Love Spain 2018 Vision Trip and 1,195 euros for those registering for the Love Spain 2018 Vision Trip after June 15, 2018. Thank you for your interest in the Love Spain 2018 Vision Trip. If you have any questions or we can help you in any way, please do not hesitate to get in touch via the Contact Us page. Please note that you will not be considered fully registered for the Love Spain 2018 Vision Trip until you have fully completed and submitted your registration below and made your trip payment. In the past, places have filled up quickly so the earlier you register and pay the better. We require all participants to carry international travel and health insurance for the Love Spain 2018 Cycling Tour. Please check below to acknowledge that you are required to have your own travel and international health insurance for this trip. (Please check box below). I will make sure I have international travel and health insurance coverage for the Love Spain 2018 Vision Trip. Your payment for Love Spain 2018 Vision Trip is refundable until June 15, 2018 and nonrefundable after that. However, your payment can be designated for another person going on the trip if you reach an agreement with that person. As mentioned previously, we recommend all participants obtain travel insurance that covers loss of revenue due to unexpected cancellation after June 15, 2018. Please check box below. I understand that my registration fee is 100% nonrefundable after June 15, 2018. The Love Spain 2018 Vision Trip is run on a non-profit charity basis. All participants join the trip fully at their own personal risk and no organizing person or organization bears any legal or financial liability of any sort for any mishaps that may occur during the Love Spain 2018 Vision Trip. I understand that I am solely responsible for my own well being during the Love Spain 2018 Vision Trip and no other party except myself bears any legal or financial responsibility in the unlikely event of any mishap (physical or financial) that may befall me during the Love Spain 2018 Vision Trip. I am participating in this activity fully at my own risk, and neither myself, family members, relatives, or friends have any right to hold any and all other parties or organizations liable for any potential harm to myself as a result of my voluntary participation in the Love Spain 2018 Vision Trip. Everyone on the Love Spain 2018 Trip will receive a trip shirt the cost of which is included in your registration fee. The shirt will be made in Spain. As a result it is European sizing which tends to run smaller than USA sizing. The rule of thumb for shirts is to go one size up from attire you would buy in the USA. So, for example, if you wear an L size shirt made in USA, order an XL. Thank you for successfully registering for the Love Spain 2018 Vision Trip! Don't forget to also make your payment so that your spot is fully guaranteed. Spaces fill up quick. See you in Spain! Please select either the early bird second payment option of 1,000 euros if you made an initial early bird payment of 595 euros prior to June 15, 2018 or the full payment of 1,695 euros below if paying after June 15, 2018 but prior to August 15, 2018 then click "add to cart" and follow the PayPal payment procedures that will pop up on your screen. If you are registering and paying for the Love Spain 2018 Vision Trip in combination with the Love Spain 2018 Cycling Tour, please select the 2,890 euro combined final option.